Sid Meier's Civilization computer game seems ripe for conversion into a board game. The PC game is, after all, basically just a computerized board game that plays out on a grander scale. Sid himself was inspired by many classic board games, including Risk and Axis & Allies. Fantasy Flight has already taken a stab at trying to distill the core mechanics of Civ down into a digestible board game when they released Sid Meier's Civilization: the Board Game back in 2010. I really like that game, even though it is a bit bloated and unwieldy. 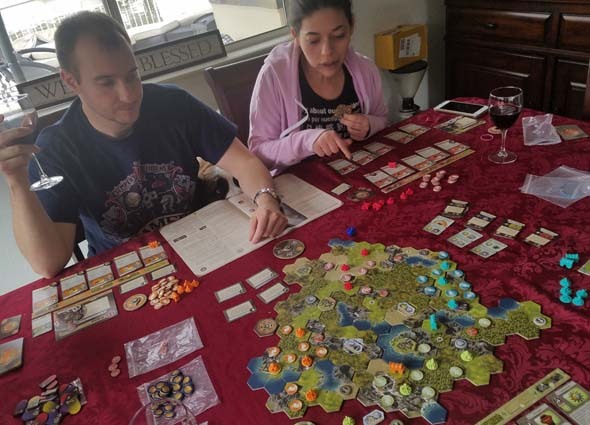 Attempting to directly translate Civ's mechanics down into board game form unsurprisingly results in a fairly complicated game that takes a very long time to learn and play. Fantasy Flight's approach this time around seems to be to develop an elegant board game, and then apply the Civilization license onto it. The result is a board game that feels much more distant from the computer game, but which plays much more smoothly as a board game. Perhaps the biggest problem with the older Civilization board game is the game length and amount of downtime. Games could run for over five hours, and the fact that each player resolved their entire turn phase (city management or army movement) before moving onto the next player meant that you could end up sitting for 20 to 40 minutes, twiddling your thumbs and waiting for other players to resolve their turns. That is one of my biggest peeves with a lot of epic games: too much downtime. A New Dawn is a very elegant game. A New Dawn addresses that problem by having each player take only a single action in each of their turns. There are no phases; just take an action from your focus bar and then move on to the next player. Turns, therefore, are very quick, turnaround time is very short, and the game moves along at a rapid pace. This, ironically, serves to better maintain the "one more turn" addictive nature of the computer game. You might find yourself neglecting bathroom breaks for several turns because things are moving along so swiftly. Your turn is generally quick enough that you want to finish it before you step away or take a break, and other players' turns are so quick that you don't want to step away because you know it'll be back around to your turn in a few minutes. Longer games with longer turns and more downtime can also often result in players outright forgetting what they were planning on doing by the time the turn gets back around to them. Either that, or the large amounts of moves and actions that the other players take changes the game state so much that, when your turn comes around, the thing you were planning on doing is no longer ideal -- if it's even possible. 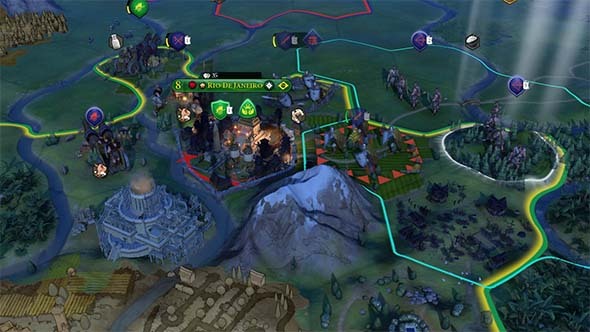 Civilization VI is an empire-building game once again! 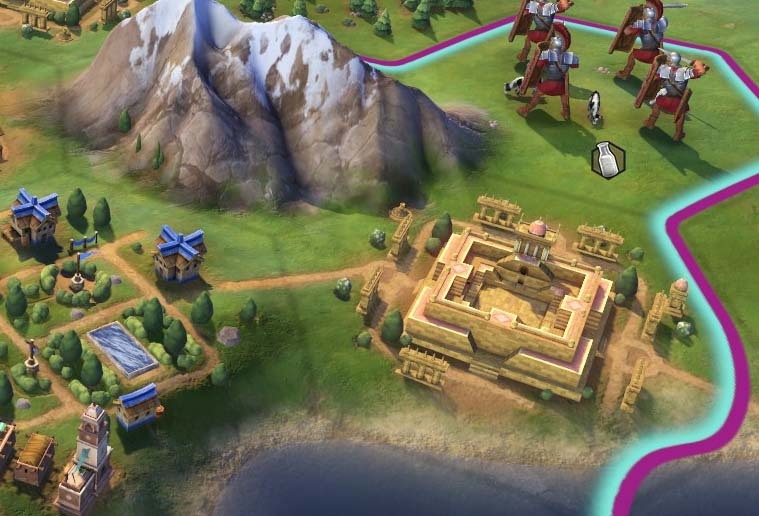 Firaxis has given me a belated birthday gift by releasing Civilization VI. They've also ensured that I don't get very much productive done during the months of October and November this year, since I've been sinking a whole lot of time into "one more turn"-ing myself late into the night. I've barely scratched the surface of the newly-released Dark Souls III DLC, my Madden franchise has fallen behind, and I haven't even bothered buying recently-released games like the new Master of Orion. My board game collection has been collecting dust, and my Dungeons & Dragons campaigns have been on hiatus. I'll get back to all those things after one more turn. The first thing that stood out to me upon entering my first game was the artwork. 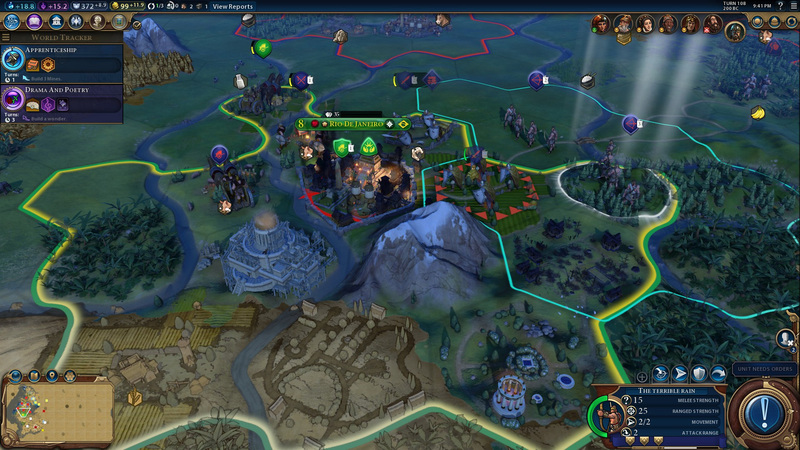 It's a pretty stark contrast from Civilization V's visuals. 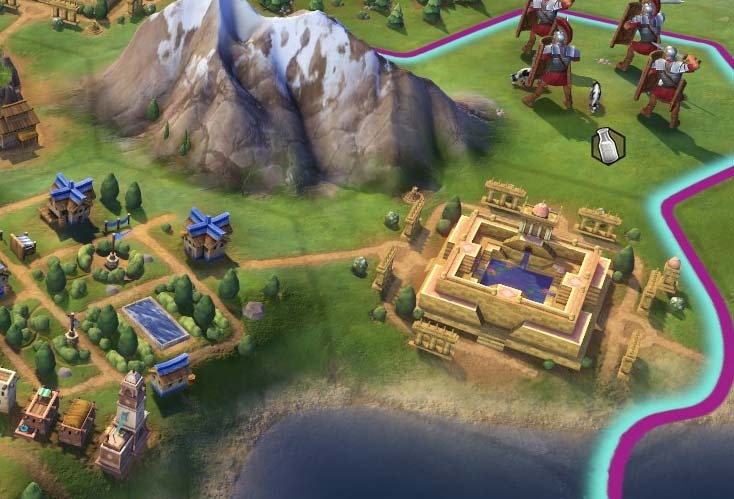 Civ V favored a semi-photo realistic quality. Many screenshots of the game's map look like satellite photos, and units (though exceedingly large) looked and animated realistically. This created a lot of pretty screenshots (still images), but the game looked kind of static, washed-out, and dull in motion. VI, on the other hand, goes for an exaggerated, vibrant, and more cartoonish look that reminds me a lot more of Civ IV and Civ Revolution. The graphics are vibrant and highly informative. Everything that you see on screen genuinely means something. What I really like is how utilitarian the visuals are. Almost everything on the game map is communicating part of the state of the game to the player. 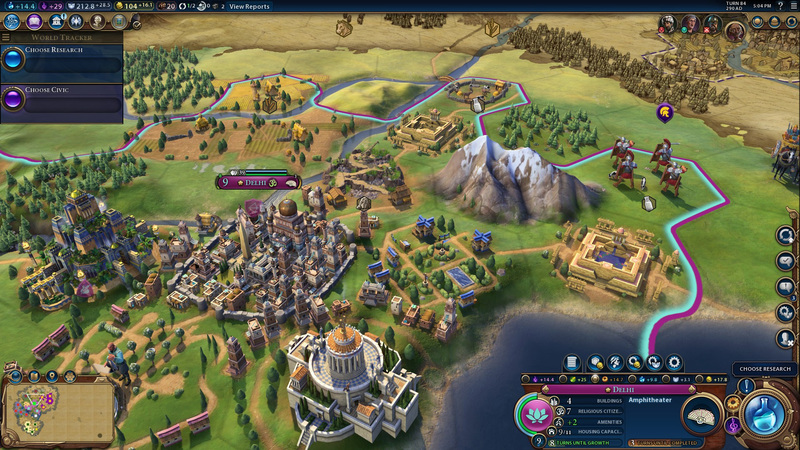 You can see every piece of infrastructure in and around a city, as well as exactly which tiles are being worked, all without having to open a separate screen and without having to clutter the screen with extra UI icons. 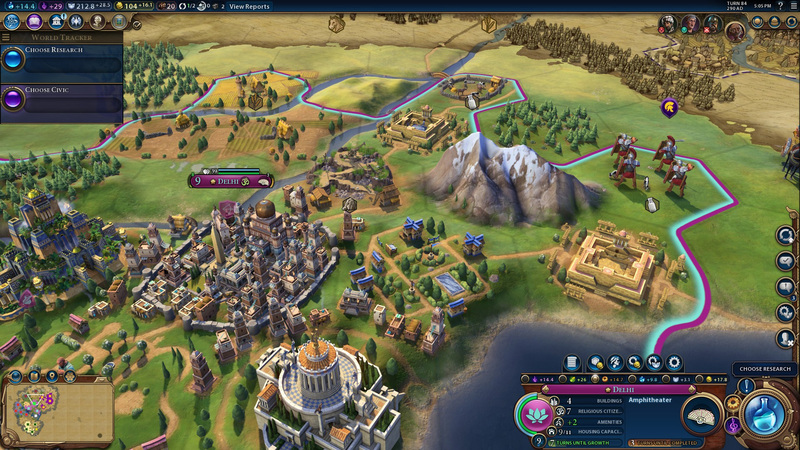 There's even different graphics to represent the different phases of a building or wonder's construction that tells you exactly what that city is currently constructing, and how close it might be to finishing that wonder. It's attractive, but it's also clean and informative. The fog of war is also wonderfully functional and neat to look at. This game renders the fog of war with the style of a hand-drawn map on canvas (similar to Total War: Shogun 2, which I loved). Heck, there's even an animated day/night cycle that was seemingly added because ... why not? Improvements have different graphics for when they're un-worked [LEFT] versus worked [RIGHT].